for which the same bar represents 75, not 100 microns. Fig. 1, 4, 5. Rhopalastrum mülleri. IOW 158(F), BSW 47(F) and BSS 32B(F) EF N53. 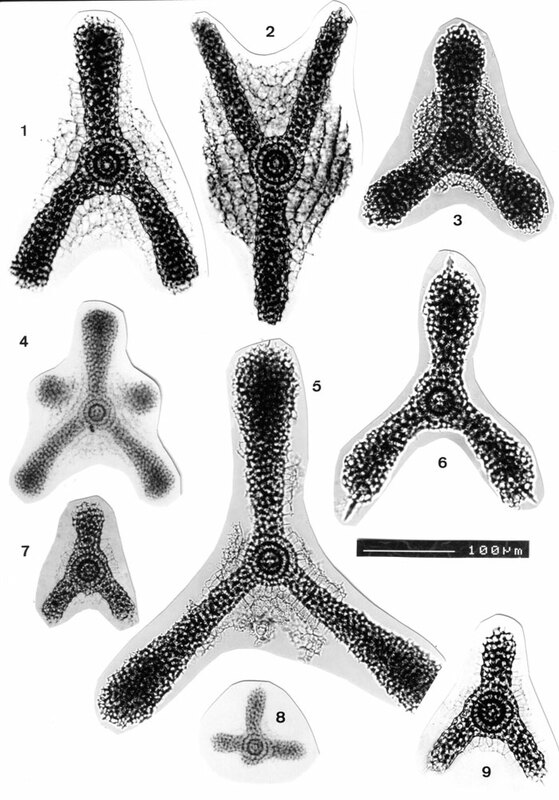 Note similarity between arms and patagial development in fig. 4 and greater thickness of arms and terminal spines in fig. 6. Fig. 2. Rhopalastrum elegans. IOW 158(F). See also PI. 49. Figs. 3, 6. Possible hybrids between Rhopalastrum and Dictyocoryne. BSS 34B(F) EF 34 and BSS 15OB(F) EF N36. Figs. 7-9. Rhopalastrum indet, from the surface water. BSW 3(F) EF 027, BSW 28B(F) EF J36 and IOW 138(F). Figs. 7, 9: juveniles; fig. 8: deviant form with deformed third and incipient fourth arm.